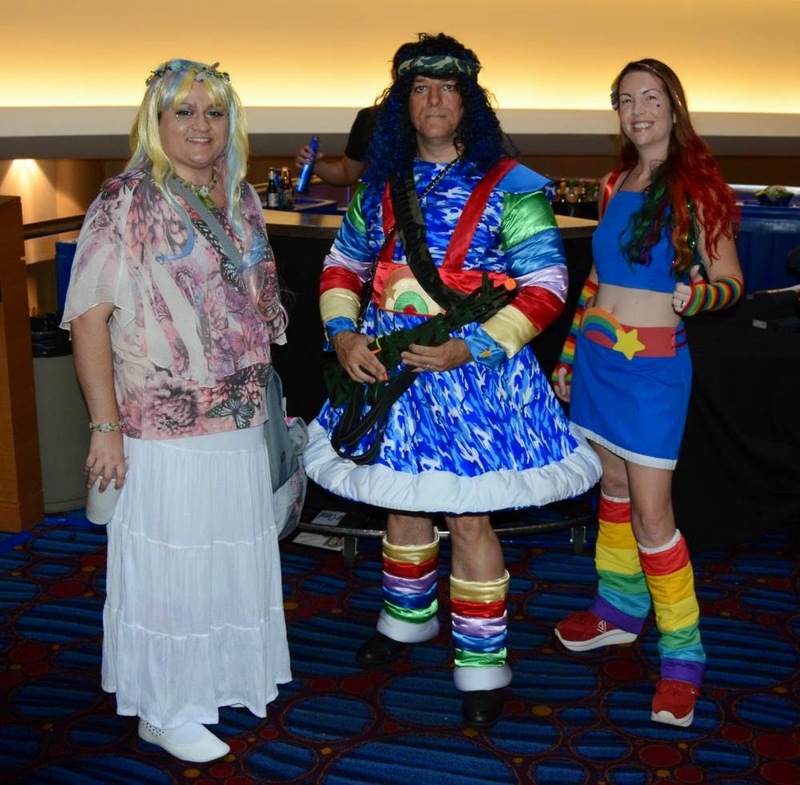 Share the Rainbow: A Rainbow Brite Fansite Production Blog: The Wrath of Con! It's been a few days past that of the Dragon Con event in Atlanta Georgia, and I am truly feeling it. My costumes were perfect for the convention. All were very nice and light and comfortable in the heat and humidity. My shoes also held up nicely each day. I was able to meet up with Katy Haile from RainbowBrite.Net and she and I were able to share the rainbow with so many fans we saw! We promoted our websites and the podcast to many there who loved Rainbow Brite and took the time to tell us so. 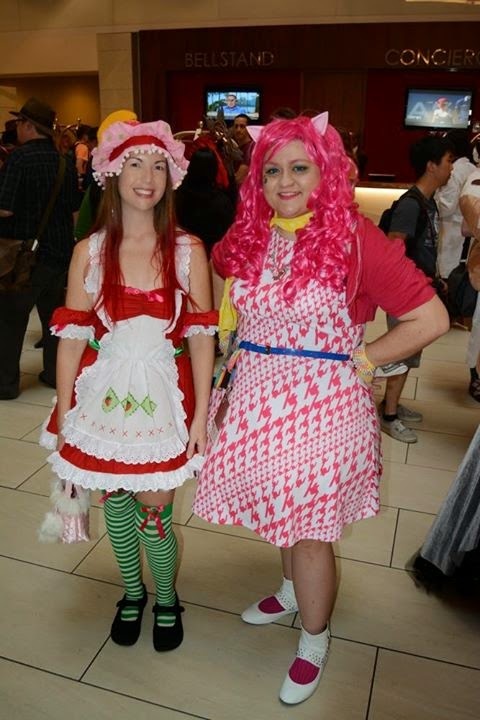 Day 1: On the First day I dressed as Pinkie Pie from My Little Pony. This day was a "discovery" day where I spent most of my time hunting down the places I would want to visit later. I went to the walk of fame and also got autographs I wanted early. I then met with Katy after the Panel with C Thomas Howell and Cary Elwes. I fangirled on Goofy (aka Bill Farmer) on the walk of fame, but it was worth it. I also met Gigi Edgley in the elevator. She stood right next to me. I didn't know who she was originally. I said "You look familiar" she said "I was on a show called Farscape" and I gasped and said "Jim Henson's Creature Shop!" as I watched ALL those and loved it greatly. She was the hostess of the show. It was so nice to meet her, but I didn't take the interaction beyond that other then to show her to the escalator so she could leave to the event she was trying to get to. Day 2: I dressed as Rainbow Brite and Katy dressed as Baby Brite! We went to a She-Ra Panel and met up for an 80's Cartoon photo shoot arranged via Facebook. I am not on many of those pages, I guess I should be. That night I went to the Georgia Aquarium and met another Rainbow Brite there. 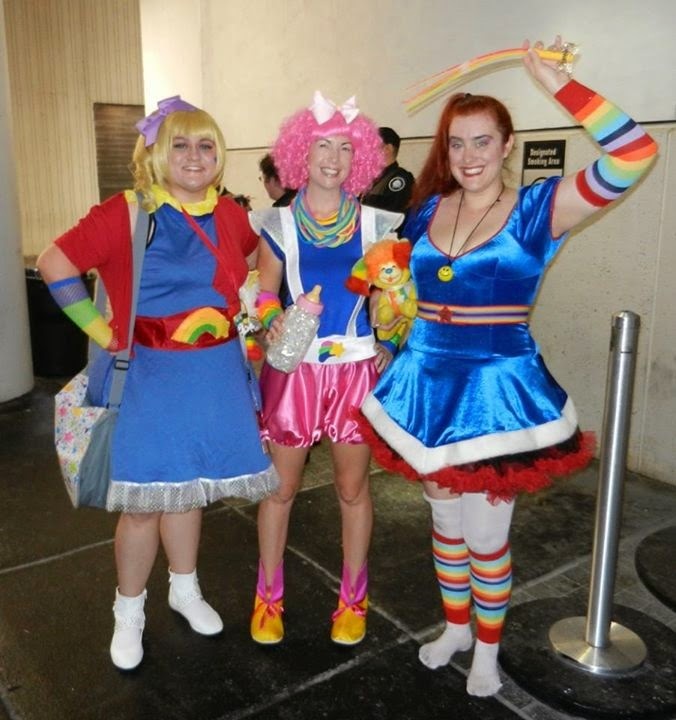 It was very much a Rainbow Brite Weekend. Day 3: My last day at the convention I decided to wear a less complex outfit and dressed as a Unicorn. Originally I had designed his outfit to be around a "Last Unicorn" ponch, which I was unable to get before the convention. I compromised by wearing a generic butterfly tunic shirt with long white skirt. The unicorn horn was designed by me, and I really need to make an online tutorial for how I did it so that other fans can make Unicorn horns. The last day I went to more panels and parties and even ran into a "Rambo Brite" cosplayer. I met him at my local con, but was unable to meet up with him because my costume melted. I really wish I had now! His costume was FANTASTIC! Over all the convention was fun and I look forward to going to more now that I have a better idea of what to expect. While waiting in line Katy and I recorded a quick Mini podcast part which should be up soon. Since I got home from the convention I've had to deal with fatigue. I call this the wrath of con...the fatigue that follows such an event when you aren't used to it. I need to work on that for my next one.